I feel for you. You know I love you. 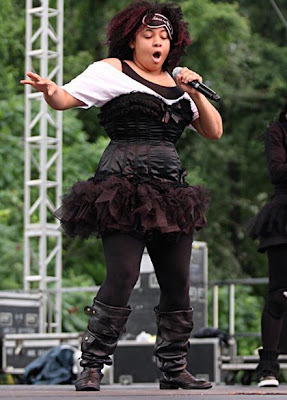 IBBB reader, Tina from Detroit, sent me this brilliant photo of Raven Symone singing after I made a little comment about her in the Lil Kim post yesterday. Seeing this photo of Raven makes me think that, clearly, I was dead on. I’m not 100% sure what Raven is wearing as I busted into seizures (yes, you bust into them) after I was in a trance over her middle area. However, I’m pretty sure that Raven stole these clothes from Vanessa’s closet during the season finale of the Cosby Show. I’m almost certain she is paying tribute to Vanessa and/or Denise by wearing all of their clothes….at the same time. Celebrity Tip of the Day: Heavy celebrities shan’t layer their clothes as it adds too many dimensions and pounds to their portly frame and it is always dangerous to cover their blowhole.